Instant Pot Shrimp Boil takes just a few minutes of prep work and only two minutes to cook. You can have a delicious homemade meal in just under 30 minutes. Easy shrimp recipes are traditional in our house, as they make the quickest and most delicious dinners. I also love Bacon Wrapped Shrimp, Instant Pot Shrimp Boil and PF Chang’s Crispy Honey Shrimp Copycat, because they all take less than 30 minutes to make and are very tasty! 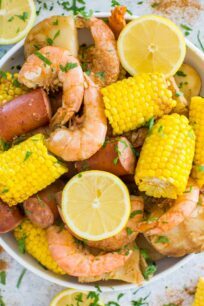 Instant Pot Shrimp Boil is one of my favorite meals to make during summer. I love the combination of seafood, juicy sausage, and sweet corn, and the flavors they produce. This Instant Pot Shrimp Boil will make your life so much easier and way tastier. This recipe is full of flavor, and the best part is that it can be ready in just about 30 minutes. 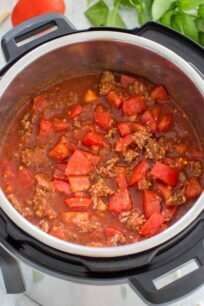 All you need to do is add all the ingredients to the Instant Pot or any other electric pressure cooker and cook for 2 minutes. That is it! Isn’t that amazing? I love adding garlic powder, onion powder, and Cajun seasoning to the pot, and drizzle a garlicky buttery sauce at the end. A squeeze of lemon and some fresh parsley are the perfect touches. I like using wild-caught shrimp, they will definitely have a better taste than farm raised. Skip the sausage and double or triple the shrimp or the potatoes, if you don’t eat meat. No need to alter the cooking time. I use a combo of garlic powder and fresh garlic, adjust based on preference. 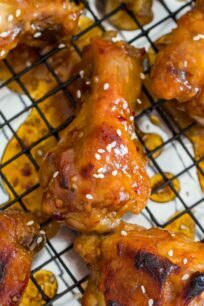 For a spicier kick, add red pepper flakes or increase the amount of hot sauce. The beer can be replaced with chicken/veggie broth or water. Does the alcohol from the beer cook off in the Instant Pot? When you are cooking with alcohol using a Pressure Cooker (Instant Pot) or slow cooker, the alcohol won’t evaporate as when you were cooking on the stove-top. The alcohol is sealed in this case, and only a portion of it will evaporate into steam. Therefore, the dish should only be served to adults. You can replace the beer with broth or water. What wines pair well with Instant Pot Shrimp Boil? A fruity white wine would be a perfect candidate. A cold bottle of Sauvignon Blan, Riesling or Pinot Grigio are always great matches for rich and somewhat spicy shrimp. Cajun Seasoning – you can also use Old Bay, whichever you prefer more. 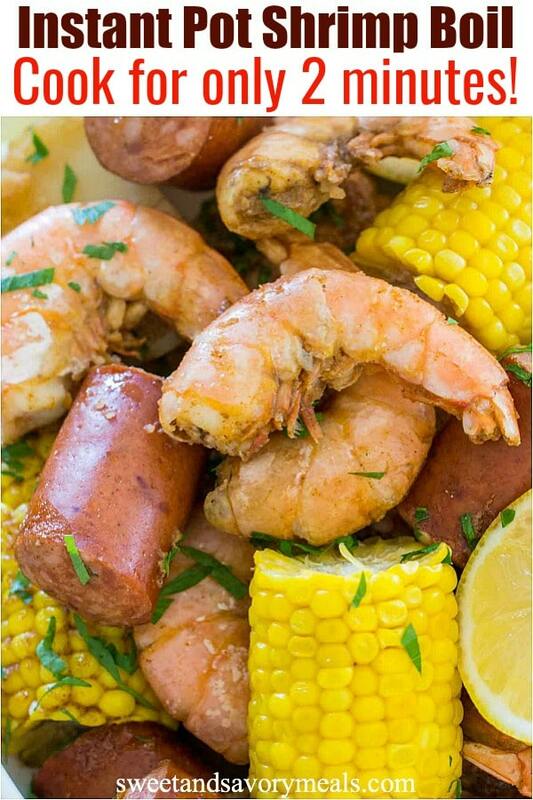 Instant Pot Shrimp Boil takes just a few minutes of prep work and only two minutes to cook. You can have a delicious meal in under 30 minutes. Place potatoes, sausage and shrimp into a 6-qt Instant Pot. Add seasoning: onion powder, garlic powder, cajun seasoning, garlic cloves, hot sauce and bay leaves. Close the Instant Pot and make sure the valve points to Sealed. Select manual setting and adjust pressure to high, and set time for 2 minutes. When finished cooking, quick-release pressure according to manufacturer’s directions. When the Instant Pot beeps and the cooking has finished, do a quick-release. Add butter to a medium bowl and microwave until melted. Stir in garlic powder and cajun seasoning until fully combined. 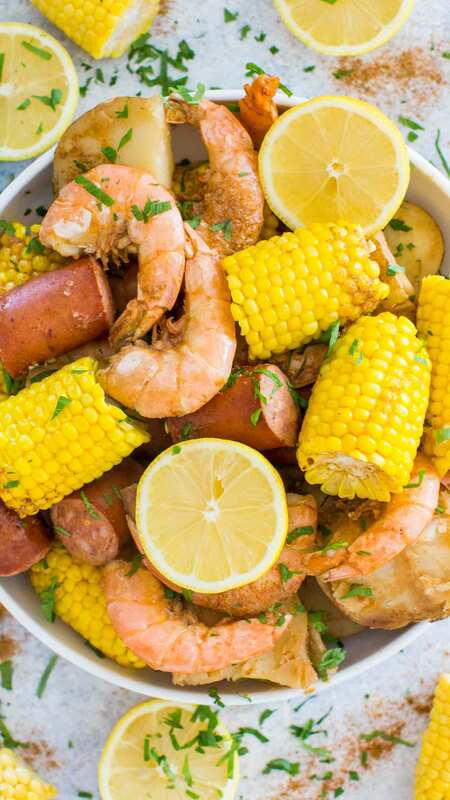 Serve shrimp boil immediately, drizzled with the butter mixture and garnished with chopped parsley and lemon wedges. I need to try this! I just bought an Instant Pot on Prime Day! Took me long enough! This would be perfect to try this weekend! Yum! 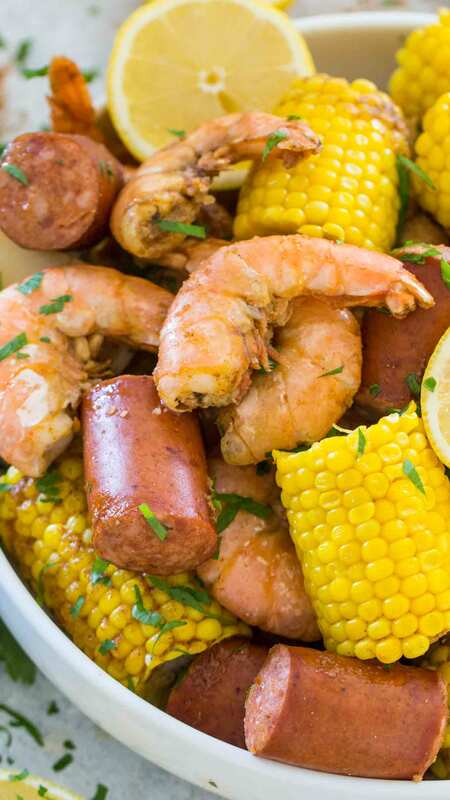 I’m going to have to try this…I’ve never made a shrimp boil! Made this last night and it was delicious! I do think you need more liquid though because it took a while to come to pressure. It fed my family of 4 with some leftovers! Have this going right now! Can’t wait to eat lunch with my guys! 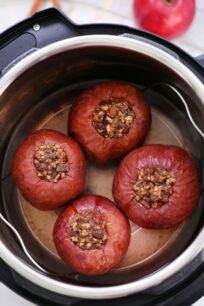 What a great instant pot recipe! I have to try it! 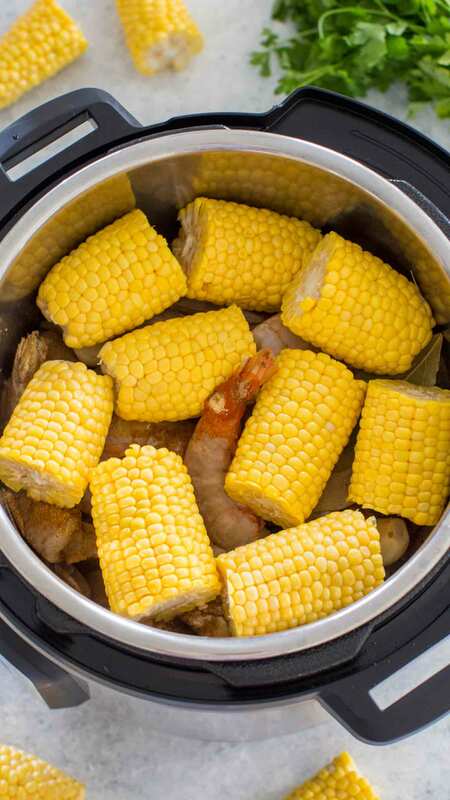 I’ve tried a few different methods to make a shrimp boil in the Instant Pot – it is tricky because the potatoes and corn typically take longer to cook than the shrimp. Did you find that everything was cooked pretty evenly with this time? Did anything get overcooked? It cooked pretty evenly for me, I have many people on facebook sharing their picture of the recipe and everyone loved it. Thats why I cut the potatoes, to make sure they cook as quickly as everything else, keeps the shrimp from over cooking. I’m going to have to try this. I have to put this on my menu! so glad that you liked it! Should the shrimp be frozen or thawed? Made this tonight and it was delicious! Made this for dinner tonight. Didn’t have sausage so I used cut up chicken breast instead. It was delicious! Couldn’t believe everything cooked in two minutes. Can’t wait to try it next time with the sausage. Thanks for the great recipe. I would love to try this. is it spicy? I can’t handle any spice. I do love eating at boiling crab n places like that but I always get the lemon pepper flavor and non spicy. I’m pretty new to cooking in general so is there a way to tweak this to make it the lemon pepper flavor and non spicy? Is the shrimp and corn thawed? My first ‘Dinner’ in my Instapot (I have been doing oatmeal and egg bites for a while)….SOOOO FABULOUS! I followed the recipe exactly and it was perfect! The Pilsner added great flavors throughout and it was amazing that each item was done perfectly! Thank you! This was the best thing I have eaten in a long time, first time using our New Instant Pot. Tasted like my dad’s Shrimp boil (he’s from Louisiana). The only thing we did different cause this is how do shrimp boils, is put the Zatarian’s Crab Boil Oil concentrate in there and oh my it has AMAZING. The we got were fresh with the heads still, they were Key West Shrimp. Could you freeze the corn, potatoes and corn and then toss in IP with other ingredients at a later date? Would cooking time be same? no, as it will take longer to cook and the shrimp will be very over cooked, sorry.